Gambling on the future of VR: A safe bet? I'm sitting on the back of a plastic horse, wearing an Oculus Rift Jockey Helmet, in an open plan office in Shoreditch. What I suspect, while I'm whooping away at my computer-generated VR experience of the 6.10 at Kempton from February 2015, is that I look like a bit of a fool. I can't see the undoubted smirks of William Hill's innovation product lead Alex Rutherford nor hear the titters from his co-workers on the third floor of the company's future-facing WHLabs centre but it doesn't particularly matter. I'm in the zone. I'm Tony McCoy. I'm hanging onto my invisible reins and reaching for a whip that my hands will never find as I urge Hector's Chance to make up the last two metres on the home straight. He doesn't, and were Get in the Race a live experience and not just a downloadable demo of what the future of gambling might look like, I'd have lost my stake. It's perhaps fortunate, then, that I'm not much of a betting man but while I'm not fond of a flutter, I've certainly enjoyed the run. This is exactly what William Hill has tried to get out of its first foray into wearable technology as Rutherford explains after I've dismounted my steed. "Betting's exciting as it is but we wanted to create the most enjoyable and memorable experience that's possible so that it's not simply hand over your cash, then win or lose. We want to increase that thrill of the ride." It certainly does. Although, as with most early tastes of immerse VR experiences, it's hard to tell how long that novelty will last. Get in the Race is designed to be as lo-fi as possible. It's not a live camera view but a computer generation, with surprisingly few polygons, based on sensors already in place on the horses and at the racetracks themselves. GPS and health monitors in the saddle allow for the positional and velocity data as well as an interesting heart rate measure of your chosen piece of bloodstock. Look down to your ride and you'll get all that presented. Look across at your competitors and you'll find out how they're getting on as well as how far ahead or behind they are. Along with the live race commentary in your ears and a few renders of significant scenery, it's really all you need to get the buzz intended. The beauty, of course, as far as William Hill is concerned, is that it's so light that it requires no more processing than you'd find on a smartphone. The experience can run on Google Cardboard and with a host of other cheap VR viewers expected under the tree this year, it looks as if William Hill may have timed its run just right. "The Oculus is the high-end but not many people are going to invest three or four hundred quid on one of those whereas something like Google Cardboard gives you an excellent experience," said Rutherford. "Whether it will have widespread adoption is partly down to the product but the customers have loved it so far. It's also partly down to how widely adopted things like Google Cardboard will be and whether VR reaches a general tipping point and social acceptability. "A few years ago we probably couldn't imagine people going round looking at their watches for text messages but now that's reached a tipping point. Maybe we'll get the same with lo-fi VR as well." It's by no means a certainty that a live version of Get in the Race will ever actually make it to market but, with 90 per cent of the hard work already done and plenty of good will behind it, it would be a bit of a shame and probably something of a surprise if it didn't. More courses need to adopt the tech, the time delay between the renders and the real races could do with dropping below the five second mark and it needs to be glitch-free to avoid rogue data making horses pop-up all over the field. Otherwise it's hard to see what would stop this app. Even if it had a relatively short-lived impact on those who used it, it would probably be enough for William Hill to have achieved many of the goals behind its development as Rutherford outlines. "We're seeing that customers are getting more tech savvy and this opens up the excitement of the product to people beyond that traditional image of a smoky old bookmakers. It can potentially get a new audience. Generally, the 20s demographic will be more focused towards football but this is one of those things that can get them involved in horse racing as well." Despite Rutherford's opinions to the contrary, what it feels like William Hill has done with this app is leverage the gamification of horse racing. This is perhaps why it does feel like the experience will speak to a younger generation of gamblers. It might sound obvious but Get in the Race looks like the kind of computer-generated graphics you'd find in a game and it has a first-person perspective like most of the best-selling console titles of the past ten years have too. You can also do it again, and again, much like a game - at least until William Hill stops you from doing so with the kind of intervention technology in line with its policy of encouraging responsible gambling only. It's possible that the app might reach minors through the actions of an arguably irresponsible parent but Rutherford's answer is that Get in the Race doesn't offer any kind of introduction into the gee-gees that Channel 4 Racing on a Saturday afternoon doesn't already. We'll leave you to refer to your own moral compass on that one. Remote betting, which includes both mobile and online forms, currently makes up around 20 per cent of the total gambling revenue in the UK, so it's of little surprise that bookmakers like William Hill are keen to be first on the scene with any more new technologies, hence the Labs set up. The difference with virtual reality, though, is that there's an entirely different paradigm of the gambling environment up for grabs. It can be much more than merely another mode through which to make a transaction as Get in the Race very eloquently proves. At the same time, it's also hitting the industry in a slightly less imaginative, if considerably grander, fashion. SlotsMillion is one of the companies investing heavily in VR's potential by creating a simulation of an entire fruit machine-filled casino several stories up a skyscraper complete with lounge area, bar and cityscape views to match. 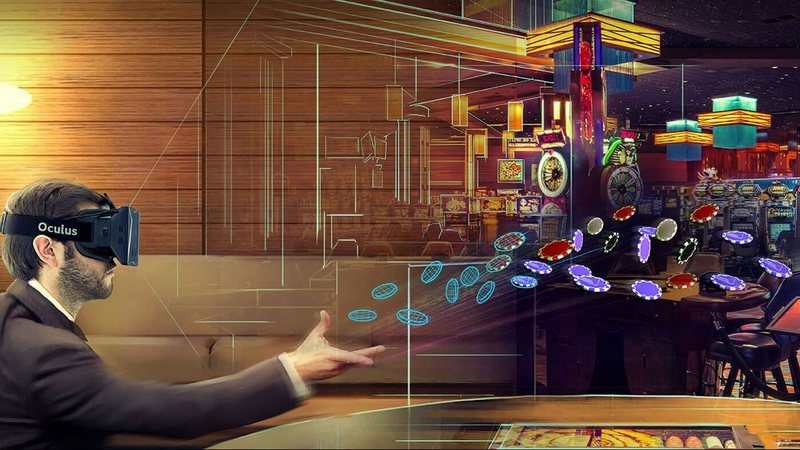 Swiss company Casino VR is focusing on the table experience instead with Texas Hold'em the game of choice, and the plan is to add more and more real casino environments as the product progresses. This kind of social experience is unlikely to appeal to serious gamblers, professional gamblers and, yes, particularly those problem gamblers who more value their presumed anonymity. Still, there is evidently a large enough class of the casual sector for these kinds platforms to be worth building. William Hill's Live Blackjack game seats you at a casino table complete with a camera feed so that you can see the cards as they're laid out and have a little banter with a charismatic dealer too. They'll chat to you, they'll chat to those sat next to you and offer that real experience without ever having to get out of your dressing gown. It might sound slightly silly but there's a lot to be said for the more human face of gaming as Rutherford confirms. "It's a very popular product for us so it seems a logical conclusion that this all moves to a more immersive experience. We'd have to see how users adopted VR and whether it was something they'd snack on in short sessions or whether they'd do something longer. Making Cardboard more comfortable would be key but a longer session than a 10 furlong race could be of interest." For now, though, even moving Get in the Race to the National Hunt jump season would prove something of a problem. According to Rutherford, it's enough of a challenge to get it right without having to worry about a whole extra dimension. "It would be phenomenal, though," he admits. "That's the dream, isn't it; backing Ruby Walsh on the favourite at the Grand National and looking at it as if you're riding?" With such a big industry behind it, it's looking unlikely that virtual reality will fall at the first. Roll on 2016.